With more and more folks starting to put miniature red dot sights on handguns, a question we see quite frequently is which RMR do I get? The RMR is pretty much the standard for an RDS (Red Dot Sight) on a handgun and for good reason. Whether it’s the new Balor mount from Raven Concealment Systems or a custom milled slide from ATEi , folks everywhere are adding these little sights to their pistols. But now that you’ve decided on an RMR, which one do you get? There’s quite a few different models out there and it can be overwhelming wading through all the different variants. Hopefully this article will help you make the most informed decision. Doctor Gary Kenneth Roberts or “DocGKR” published a very good study on the use of RDS on handguns. If you’re interested, you can read that HERE. Aaron Cowan of Sage Dynamics recently released an extensive study on various RDS sights. You can view it HERE. An RM06 on a Unity Tactical ATOM slide. In June 2017 Trijicon announced the release of their Type 2 RMR which is going to address some issues that users have been having with their battery powered RMRs. The main complaint being “dot flicker” due to poor contact with the battery terminals. Trijicon addressed this issue by upgrading the battery terminals to increase contact with the battery. The original Type 1 on the left and the newly released Type 2 on the right. Notice the Type 2 now has 2 tabs surrounding the CR2032 battery instead of one. The original RMR was designed for use on rifles. Due to their size, many folks began using them on pistols and their popularity has greatly increased. They’re pretty much the gold standard for slide mounted optics on a handgun. However, since Trijicon originally designed it for use on a rifle, it wasn’t really meant for the repeated force and impact of a reciprocating slide. Even then, the RMRs generally hold up quite well with round counts in upwards of 25,000 and 30,000 rounds being reported. The norm seems to be about 7,000-15,000 rounds before servicing is needed. These numbers will vary with exceptions on both the high and low sides. The Type 2 was re-designed with the considerations for being mounted to a handgun slide. Users can expect a lower failure rate and higher round counts compared to the original Type 1s. -Brightness adjustment lockout. You can now lock the sight in auto adjust mode to prevent accidental changes while carrying. -Battery conservation mode. The sight will adjust to ambient lighting conditions after 16.5 hours of no adjustments to conserve battery life. As mentioned earlier, the Type 1 RMRs had a few issues when mounted on handgun slides. Luckily, these issues are quickly remedied with a few simple tricks. -Use Duracell or SONY Batteries. Since the tolerances on the CR2032 batteries are somewhat loose, a common issue with these sights is the battery not making a proper connection with the RMRs contacts which causes the dot on the RMR to flicker and sometimes disappear. We’ve found that Duracell & SONY batteries give the best results. One little trick that fixes nearly every dot flicker issue with the Type 1 RMRs is to slightly bend the battery contact. If you turn over your RMR, you’ll notice a tiny tab on the side (see picture below). Using a knife or small screwdriver, slightly and gently bend the contact inwards. Be careful when doing this and don’t apply too much pressure. The goal is to just slightly bend it so it can make a better connection with your battery. Using this trick combined with quality batteries like SONY or Duracell will typically resolve any and all dot flicker issues with the Type 1 Trijicon RMRs. Slightly bend this tab so it makes a better connection with the battery. The last trick that is commonly used is to create a small shim in between the slide and the battery to help the battery make better contact. Most people have been using a few pieces of electrical tape or aluminum foil. The material doesn’t matter but the goal is to create a small shim to apply more pressure on the battery. After this method become widely accepted, Battle Werx developed a sealing plate with a built in shim called the Anti Flicker Plate. This device kills two birds with one stone so to speak. It provides a means to ensure a water tight seal (see section on sealing plates below) and it has a built in shim. For less than $10 it’s a great way to add a little extra insurance. It should be noted that these should only be used on the Type 1 RMRs since the Type 2 RMRs have different battery connections. The Battle Werx AFP uses a built in shim to apply proper pressure on the battery. You can save 10% off a Modern Samurai Project Red Dot Class. Just email them a copy of your receipt to get the discount! The first one we will look at is the adjustable LED models. These are model numbers RM06, RM07 and RM09 and all of them feature a red LED dot. These models are all identical except for the size of the dot. They have 8 different brightness settings with an auto adjust feature but also has adjustment buttons on each side that allows you the ability to manually adjust the brightness in the event that you need to. They run off of a single CR2032 battery with an advertised life of 4 years if left on setting 4 of 8. (I recommend changing the batteries out annually just as a precautionary measure. Batteries are cheap so it’s just a way to make sure the dot is always there when you need it. The way I remember it is all my sights get fresh batteries on my birthday.) They’re also available in a variety of colors including Black, FDE, Grey & OD Green. The vast majority of folks choose either the RM06 (3.25MOA) or the RM07 (6.5MOA). The RM09 has a dot size of just 1MOA which most folks (myself included) just find too small for use on a handgun. On a rifle, it might be more desirable so keep that in mind. Just for a reference your average front sight on a pistol is about 6.5MOA. Most folks find this to be a good size for balancing speed and accuracy. The RM06 is half that size at 3.25MOA. One thing to keep in mind is at higher brightness settings the dots will appear larger. So for instance on your 3.25MOA RM06, with the brightness turned all the way up, your dot will become something closer to 5 or 6MOA. Just something to keep in mind when selecting which dot size is right for you. There is a little bit of a learning curve when using an RDS on a handgun so if you’re new to an RDS on handguns, the 6.5MOA RM07 might be the choice for you but it is largely personal preference. Something to keep in mind is that anytime you’re mounting an RMR to a surface that does not provide a completely flat surface that the entire RMR can sit on, you need to also install a sealing plate. On the bottom of the RMR is a small gasket that will keep water, dust, dirt etc out and keep your optic running. When mounted on a pistol, this gasket is typically not completely covered and is unable to provide the protection needed, Luckily the sealing plate is cheap and easy to install. Another thing to remember is if you purchase a Glock MOS pistol, you need to also get the Trijicon AC32064 sealing plate and screw kit in order for it to work. The screws that come with the RMR are too long and will not work properly with the mounting plate. These are the automatic adjustment LED models RM01 & RM02. These are pretty much identical to the RM06, RM07 & RM09 that we just covered except that they are auto-adjust only. There is no manual adjustment feature or capability. The battery life is rated at about 2 years of typical use but will vary based on the lighting conditions that your optic is in. The RM01 features a 3.25MOA dot just like the RM06 and the RM02 is the 6.5MOA dot similar to the RM07. These too are available in Black, Grey, FDE, OD Green & a newly released Nickel Boron finish. While the RM01 and RM02 are a little cheaper than the RM06 & RM07, they are not the ideal option. A lot of users have reported issues with the dot “washing out” in low light conditions when a weapon mounted light (WML) or handheld is used making it difficult or impossible to see the dot. It is advised to go with the manually adjustable RM06 or RM07 version to avoid this problem. The RM01 and RM02 in Grey and Nickel Boron. They’re pretty much identical to the adjustable LED versions except there is no adjustment buttons on the side. The last type that they offer are dual illuminated, battery free models which use fiber optics and tritium to produce the dot. There are quite a few options available in this setup too with different colors and shapes. 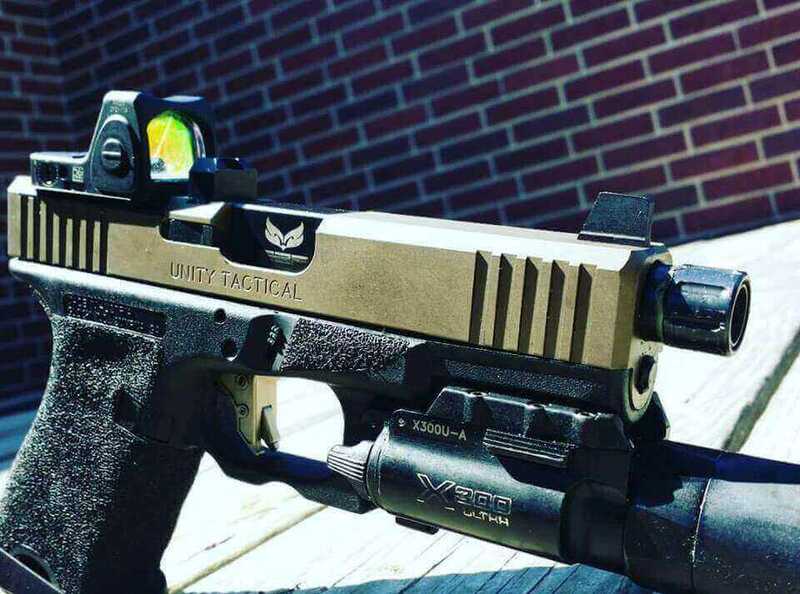 These are the most affordable variants that Trijicon offers and they come in the same Black, Grey, FDE or OD Green bodies that the other versions do. The tritium lasts about 10 years before the brightness starts to fade at which point, you would have to replace the optic. One major difference between these and the LED models is the dual-illuminated versions come in either an Amber or Green dot or triangle. At first glance, it may seem like these are the way to go. After all, there’s no batteries to replace or die and they’re the most affordable. What’s not to love? The problem with the dual illuminated models is they are not able to be adjusted for brightness and a lot of folks have had issues with the dot washing out in low light conditions with the use of a white light similar to what happens on the RM01 and RM02 versions, only worse. It may sound like a good idea but they are known to be problematic as far as the dot brightness goes. That’s pretty much it as far as RMRs go. Hopefully this gives you the information you need to select which one is right for your application. Here’s a few links and videos that you may find helpful. Primary & Secondary on Facebook. Shop for mlb best factory with the 68 Jon Feliciano Jersey authentic cheap price and fast free shipping from china. Can I put this RMR of a Rifle in 3006 Kal.